Earlier we had exclusively reported about the upcoming Galaxy On5 and Galaxy On7 listing on the Samsung India’s official website. In China, the devices are already available for pre-order and coming to the pricing, the Galaxy On5 is listed for 998 Yuan (approx $157 / Rs. 10,200) and Galaxy On7 for 1398 Yuan (approx $220 / Rs. 14,300). As per the tip we have received, the Galaxy On5 was mistakenly listed on Flipkart at midnight yesterday and by today morning the listing was removed. 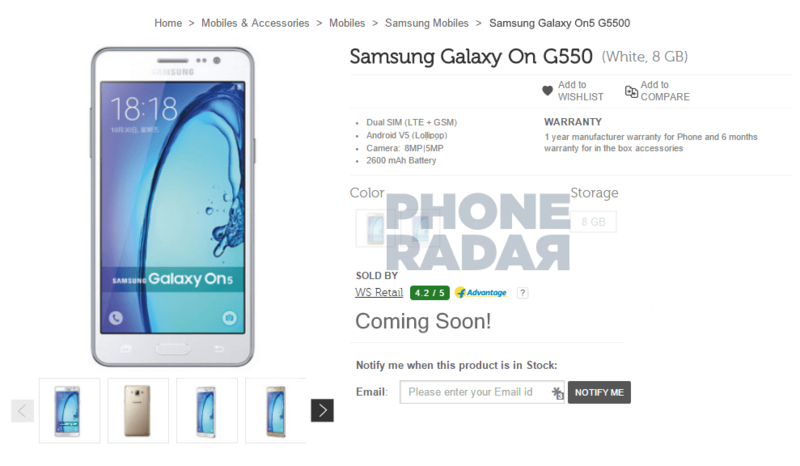 The device with the name ‘Samsung Galaxy On5 G550’ was listed as coming soon without mentioning any price. We expect the upcoming Galaxy On5 to be sold exclusively through Flipkart since the recently launched Galaxy On5 and On7 are also Flipkart exclusive devices. There is no information about the pricing and the availability of the device in India. The device comes with a 5-inch HD Display and is powered by the Exynos 3475 quad-core processor. It has 1.5GB of RAM and 8GB of internal storage along with a MicroSD card slot. The device will support dual SIM dual standby and the 4G LTE connectivity is only limited for single SIM. It has an 8MP rear camera, a 5MP front camera, and a 2600mAh battery. The specifications of the device are almost similar to their latest Tizen powered smartphone ‘Samsung Z3.’ The device runs on Android 5.1 Lollipop based TouchWiz UI. It will be available in the Gold and White colors. The company is now more focusing the entry-level segment where is a huge competition from the Chinese and Indian manufacturers. Last month the company had launched the entry-level 4G LTE smartphone Galaxy J2 priced at Rs. 8,490. Though the device is powered by the same Exynos 3475 processor as seen on the Galaxy On5, the other specifications of the device remain different.